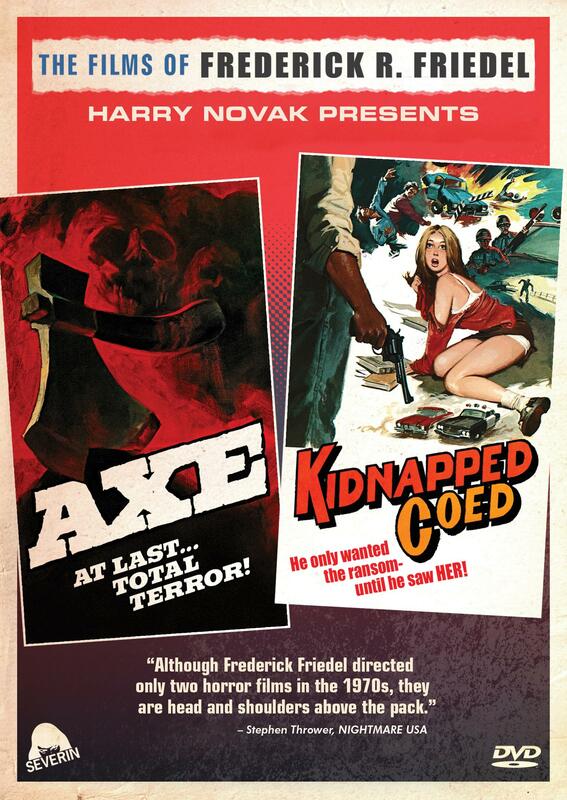 In the mid-1970s, writer/producer/director/actor Frederick R. Friedel went to North Carolina to film a pair of enigmatic yet startling low-budget thrillers – AXE and KIDNAPPED CO-ED – only to see them both presumed lost to shady dealings, sudden tragedies, moral outrage and drive-in oblivion. In AXE, depraved killers on the run hold a young woman and her invalid grandfather hostage in an isolated farmhouse. In KIDNAPPED CO-ED, the teenage daughter of a wealthy family forms a perverse relationship with her abductor. Once thought doomed to drive-in obscurity, fans and grindhouse historians have begun to compare Freidel’s films to those of David Lynch and Terrence Malick, and now the complete story behind this strange journey can finally be told. Severin Films is proud to present both features restored from their original negatives, plus BLOODY BROTHERS, Friedel's recut of the two features as one twisted crime epic called BLOODY BROTHERS, and loaded with exclusive Bonus Features that reveal the startling saga behind the casts, crews, disastrous fate and surprising rediscovery of these nearly forgotten grindhouse/arthouse classics – the ultimate look at one of the most fascinating sagas in indie exploitation history!